Save up to $3000 a month on a $1m home .. SAY WHAT ?? If you are looking in the market for a home where a jumbo loan is required, check out this great new product. 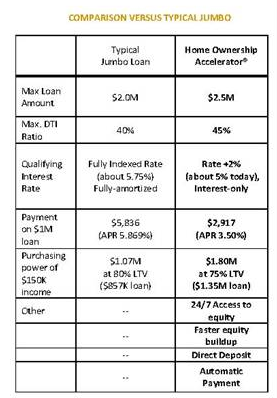 This loan will allow you to borrow more on a lower rate, on a $1m loan you could save up to $3000 a month! WHAT …. This loan combines your home loan, equity line, and checking account in one flexible financing tool. You can deposit your paycheck, write checks, just like a bank account. If you are not using your money, it keeps your loan lower saving you interest. Saving money leaves more money for the principal, so you could pay your loan off quicker .. often in half the time of a traditional mortgage. To take a look at properties in this category, CLICK HERE. Give me a call and we can discuss your Real Estate options.